I have a lifelong interest for high-performance computing methods applied to the understanding and solution of large and complex problems. These methods are necessary, for example, if we want to make sense of the intricate network of interactions between the very large number of different bio-molecules working in our cells and tissues, what leads an organism to become ill, what causes illness and how does it evolve, and how do we effectively treat it. I work designing and applying computational approaches that combine data from the different `omics' domains: genomics, transcriptomics, metabolomics, epigenomics and others, to find the most significant connections among the elements when the amount of data and the number of possibilities is insanely large. I am a rationally curious individual. I obtained my PhD in Physics in 1990. I have always been attracted to work in high-performance computing methods for solving complex problems that contribute to human wellbeing and our relation to the environment. My last eight years of research in bioinformatics combines my desire to improve the lifes of people, with my intrinsic curiosity to understand complexity and passion for computing and data technolgy. My grand goal is to make technology and science work for the solution of modern day problems: health, resources, inequity, improve quality of life. I'd like to see my humble contribution working to get better medical treatments, more economical, more effective. Carlos Riveros long term research focus is in data mining and knowledge discovery problems in large, diverse and complex data. A particular area of interest is the application of modern massively parallel compute paradigms, such as distributed grid computing, cloud computing/map-reduce, General Purpose Graphical Processing Units (GPUs) to accelerate computation in large and very large biological datasets. Design, implementation, testing and improvement of tools making use of these platforms open new avenues to test biological hypothesis at the individual level, enable more accurate identification of markers of disease, and better characterisation of different disease subgroups with different responses to treatment and survival outcome prediction. Carlos' expertise comes from a diverse career in applied High-Performance Computing for research, industry and academia sectors. 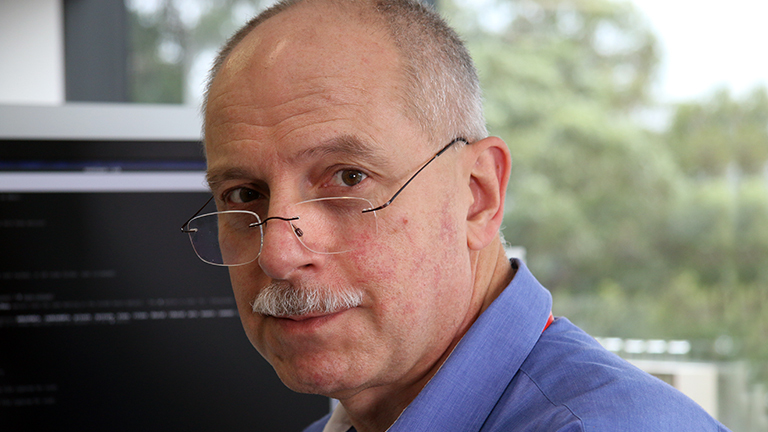 His recent work connects techniques for approximate solutions, generalised data integration models and information and graph theory approaches. It involves the use of evolutionary computation heuristics (genetic and memetic algorithms) applied to obtain approximate solutions, as exact solution methods (for example linear and mixed integer programming optimisation models) become quickly infeasible for larger problem instances. A related area is the formulation of generalised models for data aggregation and meta-analysis, with mathematical guaranties of separability, to allow for robust identification of biomarkers without loosing internal substructure in the groups being differentiated. Finally, these techniques are complemented with well-founded graph- and information-theory methods for unsupervised clustering, under different notions of element similarity. Recent publications include application of these novel methods to the analysis of transcriptomics and genomics data in complex diseases such as Age-Related Macular Degeneration, Alzheimer's Disease, Multiple Sclerosis, Breast and Prostate Cancer. As member of HMRI Research Support unit, Carlos is now oriented to bridging the gap between the needs of bio-medical researchers dealing with biological questions and the inherently complex and technically specialised data analysis techniques and skills required by next generation sequencing systems and applied big-data analytics. His future research interest relate the more technical and abstract mathematical aspects with applied and translational medical research: aggregation of next generation DNA and RNA sequencing data, integration of existing and new tools and computing platforms and biological databases, consulting in big data analytics and data integration from hospital and private medical practice data sources.